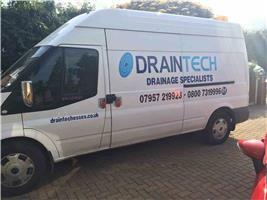 Draintech - Drain/Sewer Clearance, Plumber based in Great Oakley, Essex. We pride ourselves in offering a prompt, efficient service and are always conscious of our customers needs. We are also pleased to offer free estimates and advice. Areas we cover - Essex ,Suffolk, London,Colchester, Harwich, Clacton, Braintree, Chelmsford, Frinton, Brentwood, Walton & Manningtree. "Helping my customers sort out all of their drainage problems."